My neighbor thinks that Columbines look like fairies in flight. Me? I’ve always thought that Columbines look like shooting stars. 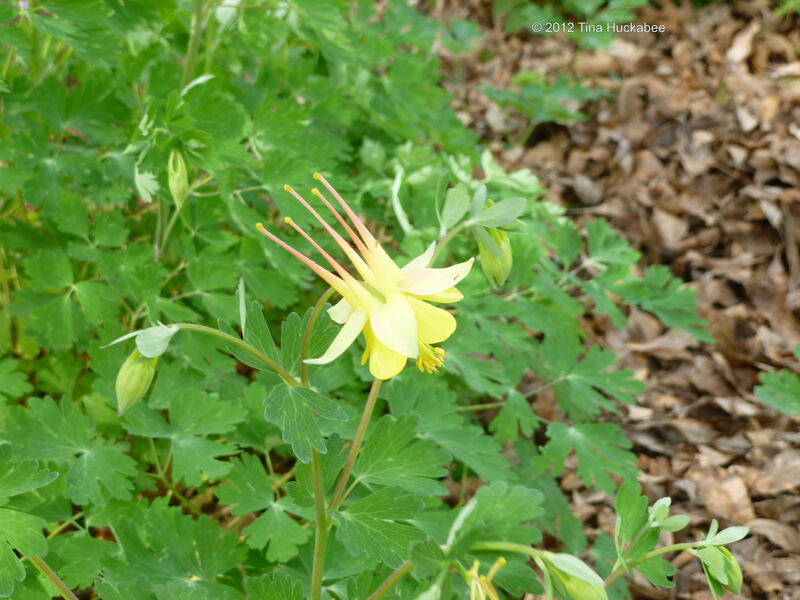 According to information about Columbines from the Lady Bird Johnson Wildflower plant database pages, the Aquilegia (genus) name comes from the Latin aquila, which means eagle. Apparently some people think the spurred petals look like eagle talons. Another of the database pages describes the etymology of the word ‘columbine’ as derived from the Latin word columbinus, which means dove. The story is that the columbine resembles a group of doves. The long spurs are the birds’ heads and shoulders, the sepals are the wings, the petals are the birds’ bodies. I must say, I’m not quite sure I see that one. Whatever whimsical, folksy story that gardeners choose to tell describing the Columbine, this is a must-have plant in the shady, xeric garden. and stunning flowers in the spring. 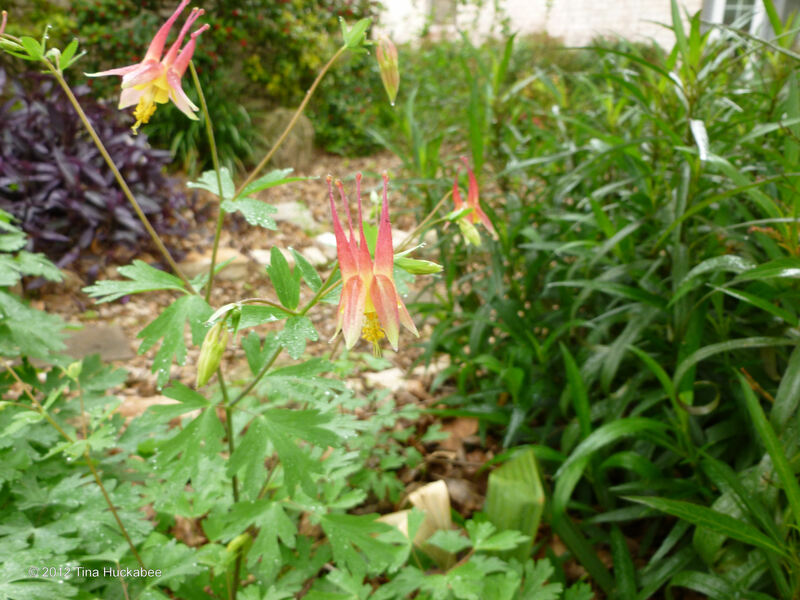 Columbines provide (for me anyway) great joy and have always represented the beginning of spring here in Austin. When I first started growing Columbines in my garden, they would reliably begin their spring bloom cycle the second week of March–roughly during Spring Break. I usually could dead-head them (until I grew weary of that chore) and they’d bloom until early to mid-June. During this past decade, my Columbines have started to bloom two to three weeks earlier–now usually beginning in late February. It’s now too hot by mid-June for them to bloom. During the summer months, they tend to shrink in size (even as small as 4-5 inches in diameter) and sometimes, individual plants will go dormant. Then, as soon as the fall rains begin, cooler temperatures arrive and the days grow short, they perk up. 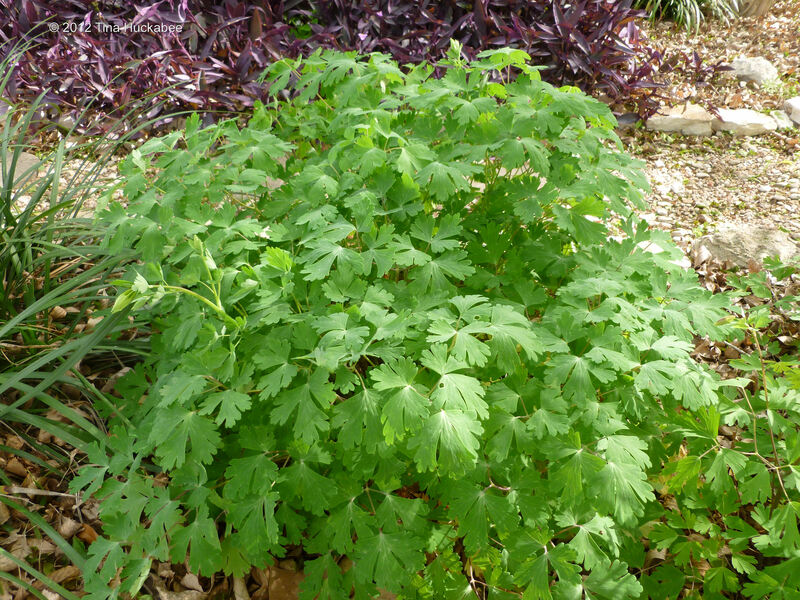 Columbines have beautiful winter foliage; the leaves are deeply lobed and bright green. They look so delicate, but I’ve seen them covered in ice and once the ices melts, they’re perfectly fine and maybe even blooming within a few days. Columbines in the wild are identified by species characteristics and often are endemic to a specific geographic area. But those bought in nurseries are cultivars and are bred and sold for their showy blooms and hardiness. 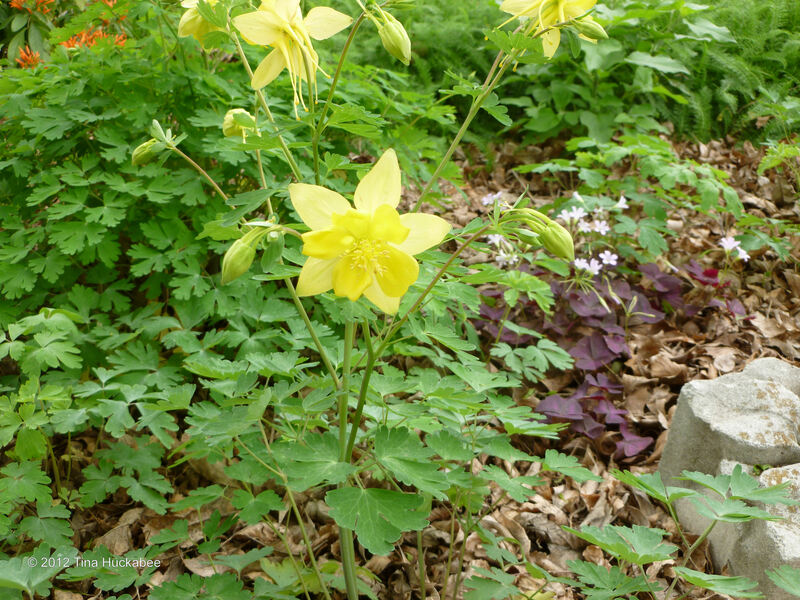 The common Columbine that many Texas gardeners buy at nurseries is the Yellow or Hinckley Columbine, or more than likely, a hybrid of those two and perhaps others. 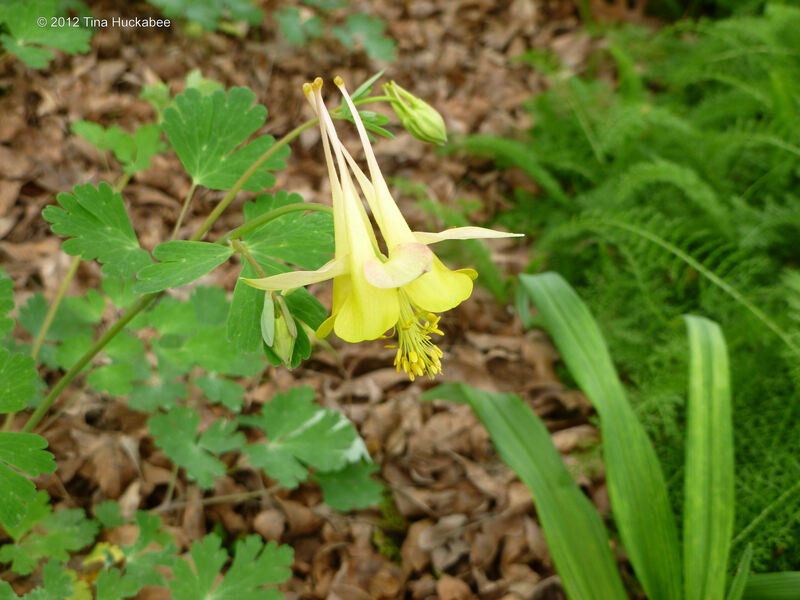 Columbines (even those in the wild) will hybridize easily between species. 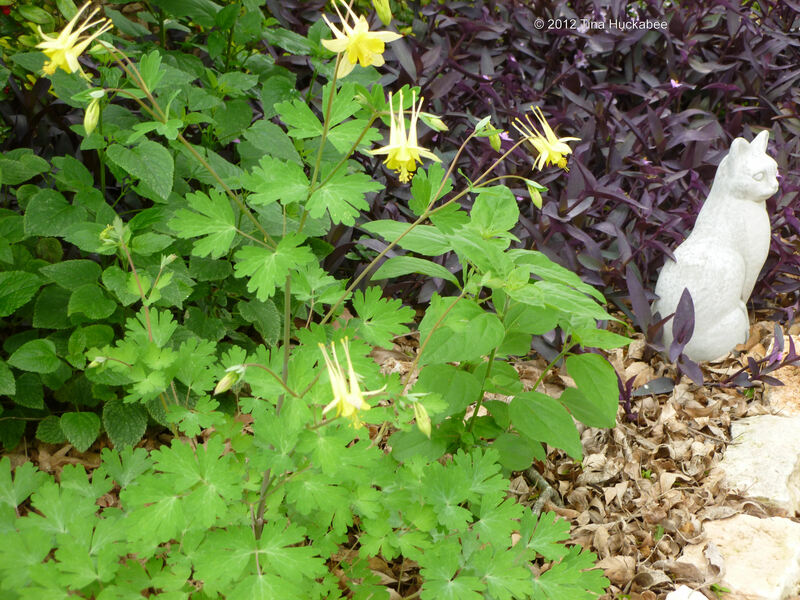 Years ago, I bought several “yellow” Columbines (I have no clue what the tag actually called it), although they were probably A. chrysantha var. hinckleyana, or a variant thereof. 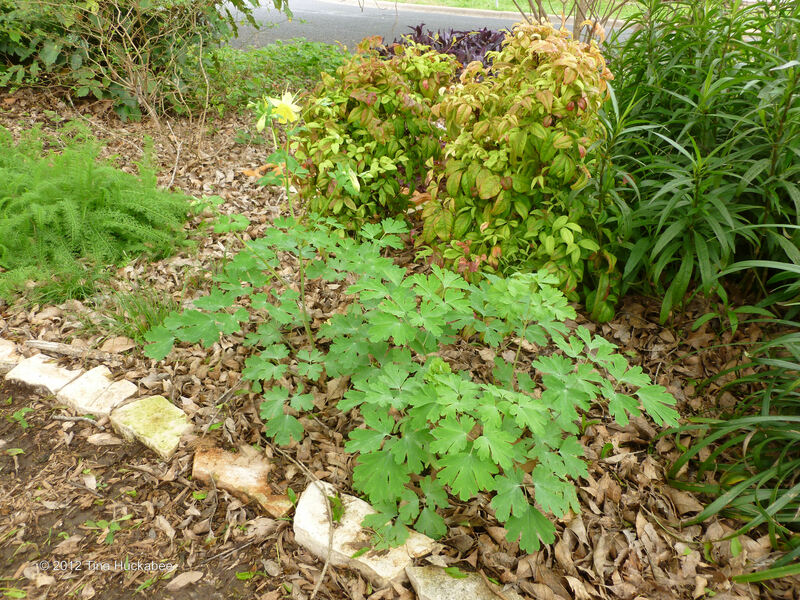 Sometime later, I added to my gardens the Red Columbine (Aquilegia canadensis), also native to Texas. Over the years, they’ve re-seeded and I now have a variety of hybrids–yellow flowers of differing sizes with a pink blush on the spurs, petals or sepals. and a Red Columbine (A. canadensis). 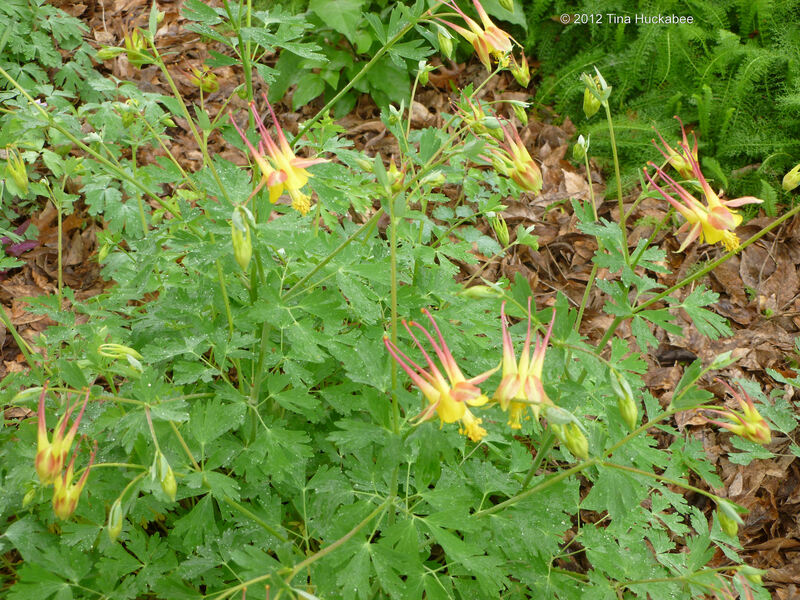 The Red Columbine is the host plant for the Columbine Duskywing butterfly. Columbines are easy to grow in Central Texas. They are reportedly deer resistant and are most beautiful during the cooler time of year (October-May), reaching the zenith of their beauty in March and April. 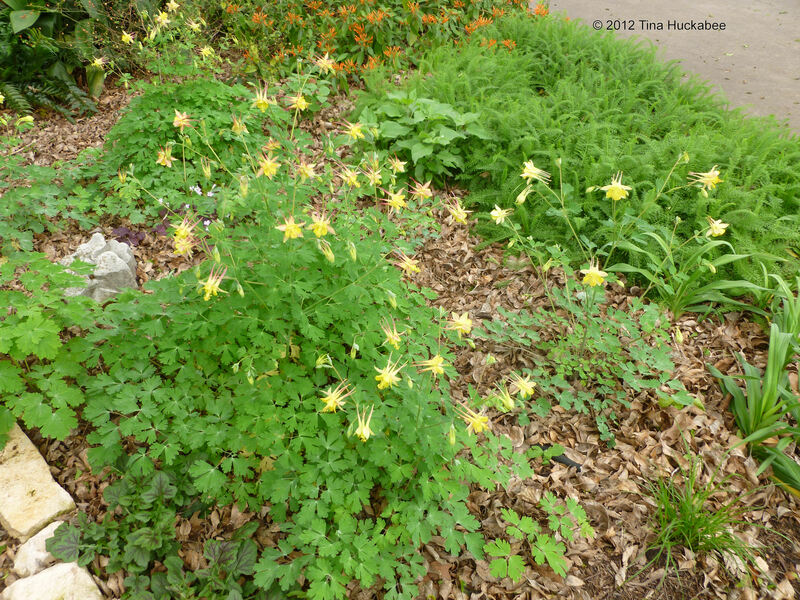 I’ve seen them grow in a variety of soil conditions, but Columbines prefer a moderately moist, well-draining soil. Columbines are considered a drought tolerant perennial and in my personal gardens, I don’t water these plants more than twice per month in our dry, hot summers. 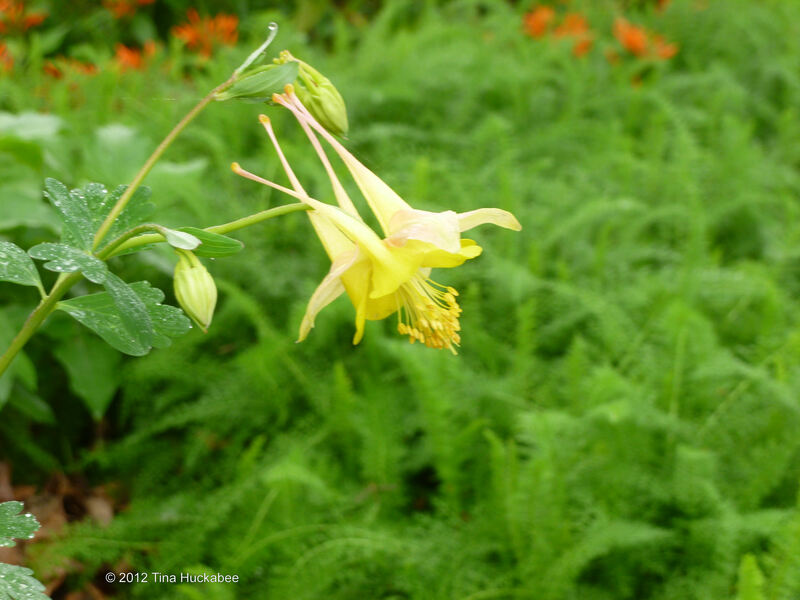 During the summer of 2011, which was record-breaking hot and dry, my Columbines limped along. I don’t believe that any died but they definitely struggled with the heat. Most of mine also suffered leaf burn, too. While that’s not unusual for Columbines in Texas heat, I noticed more damage after last summer. I simply pruned the damaged leaves and by October, they began to revive and develop new foliage and begin their march toward spring beauty. 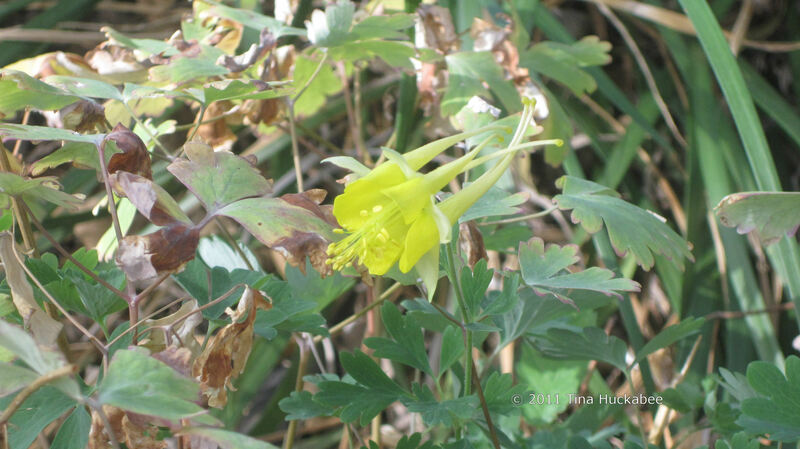 Interestingly, in October 2011, I also noticed that there were several blooms on my Columbines. I’ve never seen that before, although I’ve read that Columbines will “rarely” bloom in the fall. I assume the blooms were a response to the rain that began after our exceptional drought and heat of the past year. The only problem I’ve ever experienced with Columbines is that they sometimes develop leaf mites. The mites appear at the end of spring and end of the bloom cycle. An infestation can be diagnosed when the leaves begin to develop an unhealthy looking yellow, with some leaf mottling. If you turn a leaf over, you can spot the culprits–tiny little spider-like critters. I’ve only had to spritz mine with a blast of water from the hose (under the leaf) and generally, that takes care of the infestation. It’s a good idea though, to prune off the damaged leaves. The plant will generate new ones and soon, the Columbine is back to full health. That said, it’s been a long time since I’ve had that problem with any Columbines that I grow. Columbines are a short-lived perennial (4 or 5 years, usually), so let them re-seed from parent plants and you’ll always have some around. 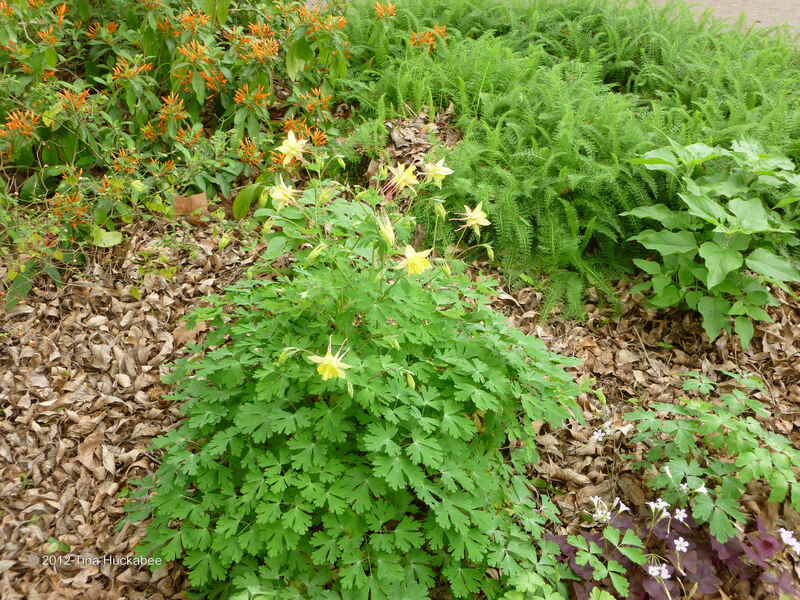 If you have shade and you want a hardy and beautiful blooming perennial, try planting Columbine. Here in Texas, stick with the Yellow or Red Columbines and you won’t be disappointed. 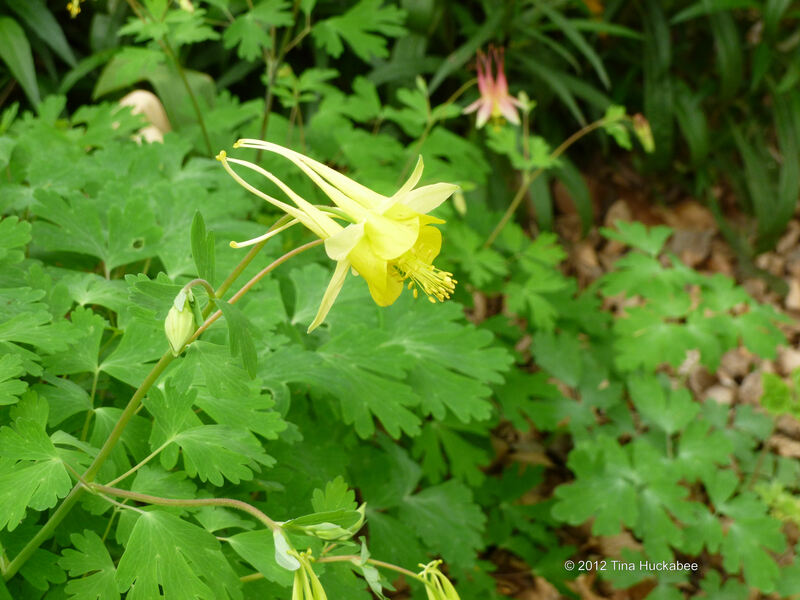 For a complete tutorial on Columbines, check out the NPIN Database Page on the Lady Bird Johnson Wildflower website. Just type in “aquilegia” or “columbine” and hit go.The window will appear with a long list of this perennial, you can click on the one(s) you’re interested in and read away! And then, invite some fairies and shooting stars and doves to your garden. 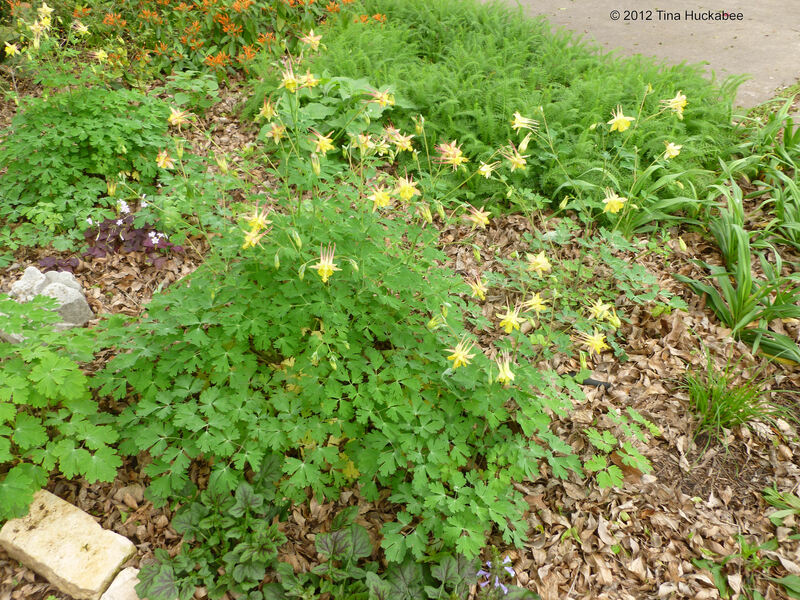 This entry was posted in Aquilegia, Columbine, Shade garden plants, Wildlife food, Xeric plants by Tina. Bookmark the permalink. Beautiful Columbines and I really like the pink blush the combinations have created. I love Columbines and they also grow beautifully here in San Antonio. I have to enjoy them in the gardens of friends because they are not even slightly deer resistant in my yard. I had read they were deer resistant and planted a row of columbines last year. The very next day all of them had been eaten to the ground! Good information if I can find a way to fence off a shady spot here though. Thanks, Shirley. I also like the pink blush that occurs over time, although, I know that some people don’t care for the hybrids as much. I wondered about the “deer resistant” reputation of Columbines, which is why I used the word “reportedly”–you’re not the only one I’ve known who has provided a breakfast/lunch/dinner of Columbine for the deer. They are beautiful, Mary. You’ll be glad when you plant them. 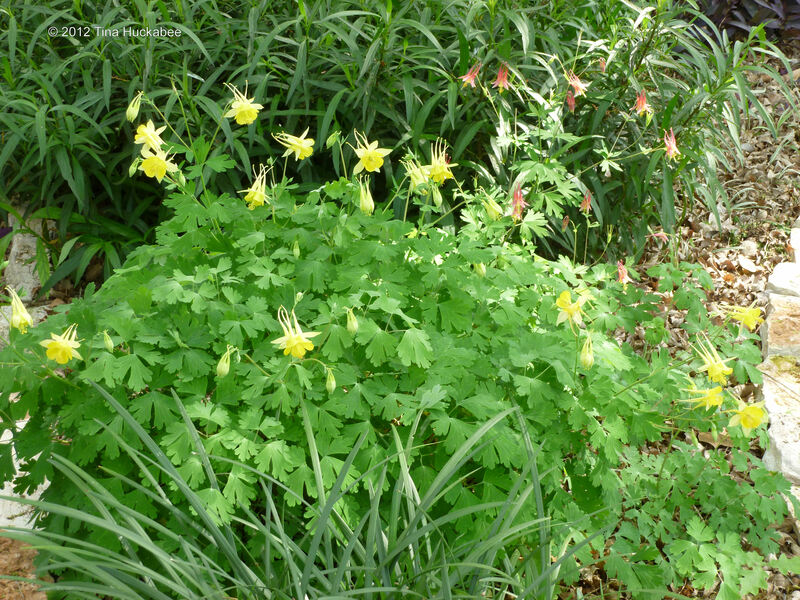 I love columbines, but stangely, I have not had much success with them. Maybe you could give me some pointers on Sunday? I’ll tell you what, Ally, you coach me on how to grow the magnificent veggies that you grow and I’ll give you some tips on columbines. 🙂 (Actually, I know my problems with veggie gardening–I’m a lazy gardener…I forget to water, to weed, I let perennials (or, this year, poppies, take over my little veggie patch. sigh).) If your columbines are rotting, try planting them with the crown of the root, raised a tiny bit higher than you might normally plant a perennial. If you’re having trouble with deer–your guess is as good as mine.